In More Now: A Message From The Future for The Educators of Today Mark Wagner, PhD., CEO and author, shares a story of how leadership at CCSD 59 in Illinois suspended teacher evaluations for two years during their 1:1 roll out (in order to remove a source of stress and resistance to the roll out). This is a great example of courageous leadership – many school leaders would probably consider this not an option, if not impossible. 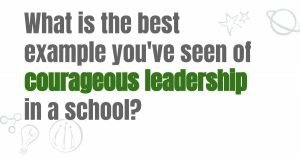 What is the best example you’ve seen of courageous leadership in a school? Tomorrow we’ll give away a copy of the book to someone who answers this question. And you can get the book on Amazon anytime.